View Kohl’s Black Friday 2016 ad with doorbuster deals available in stores from 6 PM Thanksgiving Day until 1 PM Black Friday. Shop online for Black Friday Deals starting Monday, November 21, 2016. Only once a year – $15 Kohl’s Cash for every $50 you spent in store and online. View Kohls Black Friday 2015 ad. Save with this year Kohls Black Friday deals on sportswear, robes, intimates, casual and athletic shoes, cosmetics, styling tools, fragrances, rechargeable toothbrushes, grooming accessories, heated mattresses, blankets, bed pillows and and bath wraps. 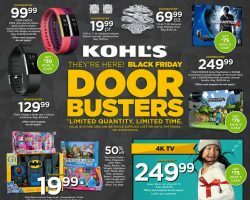 Kohl’s Black Friday Deals 2019. 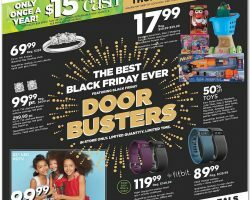 Find Kohl’s Black Friday Ad, deals and sales for 2019 from blacknfriday.com. Kohl’s is an omni-channel department store chain in America that sells a wide variety of clothing, footwear, appliances, electronics, home décor items and other types of merchandise. The business was established in 1962, having grown nowadays to more than 1,160 locations in 49 states. As an online retailer, Kohl’s offers free standard shipping with qualifying purchases and buy online, pick up in store options in addition to other benefits such as special online deals and clearance prices in various departments. Moreover, at specific times of year the retailer provides hundreds of savings both in store and online and the Kohl’s Black Friday sale featured in store only door busters such as $299.99 Microsoft Xbox One 500GB The Lego Movie Gaming Console Bundle or $299.99 Sony PlayStation 4 500GB Uncharted Gaming Console Bundle. The retailer Black Friday sale started Thanksgiving Day, 6pm in stores and lasted through Friday at 1pm. Deals were available online from as early as Monday through Friday.